If you are looking for wine to match your turkey a well-rounded with no oak, like a Burgundy white works well. André Goichot Chablis is ideal. It’s crisp, dry and easy to pair with other sides dishes. For red wine, Remy Ferbras Vacqueyras will hit the mark. 1. Preheat the oven to 200°C/gas mark 6. Put the butter in a bowl with the walnuts, sage and a generous pinch of salt and pepper and mix together. Rub some butter underneath the turkey breast skin by lifting it gently with your hands and massaging the butter onto the flesh. 2. 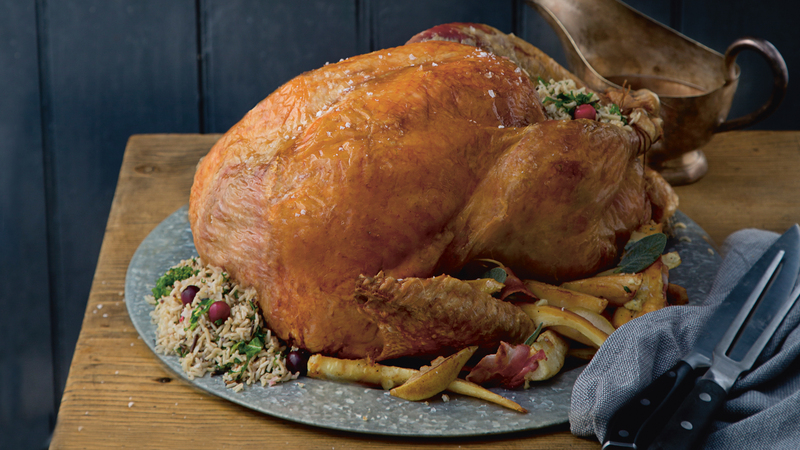 Add the wild rice, quinoa and lemon stuffing to the turkey (click here for stuffing recipe). If you like, you can cook the stuffing in a separate dish and serve it alongside any vegetarian dishes. Don’t forget to weigh the turkey again with the stuffing in it to work out the cooking time. 3. Place the turkey in a large roasting tray and pop in the preheated oven. If you feel the turkey is browning too quickly, you can cover it with tin foil for the first 2 hours. 5. Allow the turkey to rest for 30 minutes when it comes out of the oven, then carve as required. Don’t forget to weigh the turkey again with the stuffing inside it and calculate the cooking time based on that.